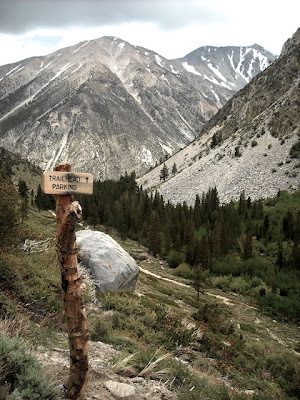 The two forks of Big Pine creek meet below the Middle Palisades in the canyon. In the spring of 2009 I had just walked across the stage for my graduation at California State University, Northridge. The lease on my apartment was set to expire in just a few weeks and I had to figure out what to do with myself during the time in between. I'd always wanted to visit the Eastern Sierra so I left my internship a few days after graduation and set course across the desert. Beylah and I got our introduction to sierra camping by weathering a storm for 2 days in Horseshoe Meadows, in the shadow of Mt. Langley. 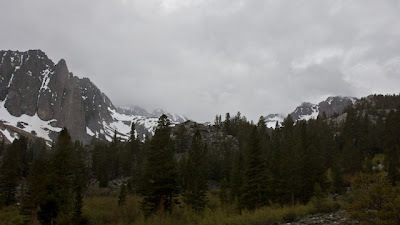 We had made several unsucessful attempts to hike up to the cottonwood basin from there but stormy conditions prevented us from getting too far (in hind seight we were also total wusses about the weather). Near the start of the trail. 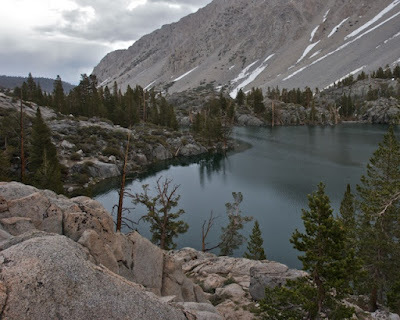 On our final day in the area we drove over to Big Pine Canyon and attempted a day hike up to the Big Pine lakes sitting in the shadow of some of the finest and tallest peaks in the Sierra. 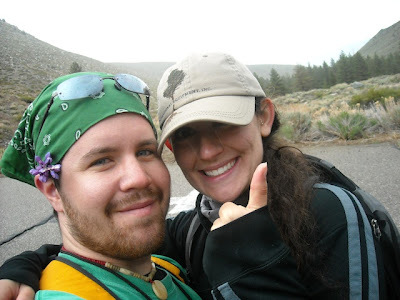 We made nearly every mistake imaginable, we traveled with no rain gear, only a pack of life-savers (ironic, right? ), and a single 24oz water bottle between us. 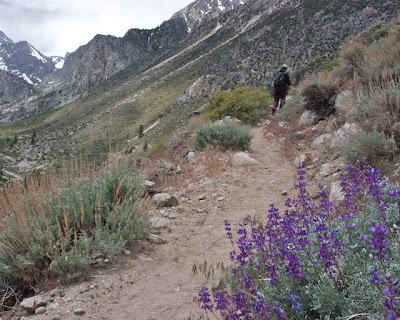 The first mile from the parking lot is phenomenal begenning with a gentle climb up a steeply cut canyon with views sweeping out over two forks of the canyon leading up to the North Palisades which dominate the skyline. 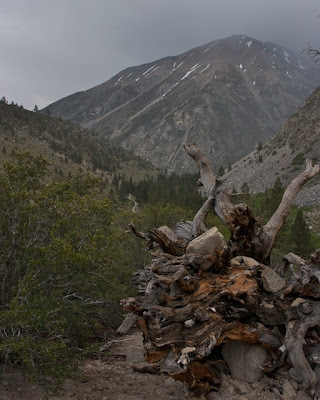 The trail itself is quite dry and few trees grow on the slopes, in fact the ecology of the trailhead has more in common with a desert than what we typically think of as sierra ecology. Beylah hiking across the dry start of the trail. 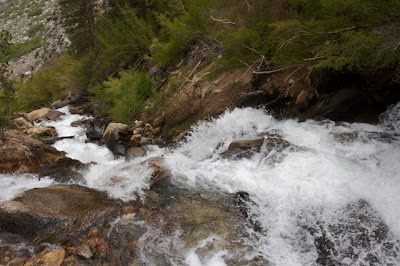 The sound of Big Pine Creek and its many cascades fills the canyon constantly. As clouds began to build above us though, the white noise was interupted by the crack of thunder ecoing through the mountains. Storm clouds building over the mountain's crest. 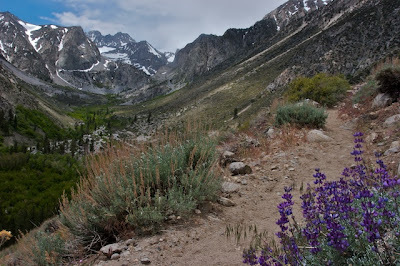 A series of steep switchbacks leads over a granite bench into a subalpine canyon. The scenery immediatley changed at the top of the falls. The pitch of the canyon shallowed, and the trees turned from scrub brush and dry pines to a thick forest of aspen trees (I can only imagine how wonderful this place would be in the fall). Even while the scenery was picking up, the reality of our lack of preparation was sinking in. 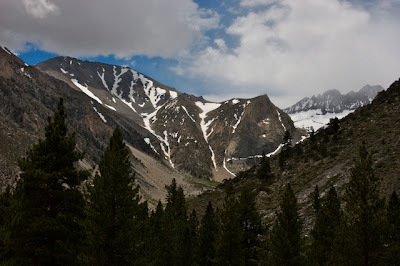 In the cold, dry air of the Sierra Nevada our lips were already becoming parched and with very little water all we could do was slow down the onset of dehydration. At the same time our stomaches were beginning to grumble as our bodies roared through the calories we had for breakfast. To make things worse we were in classic bear territory and traveling through thick aspen groves with almost no visability. Top of the 2nd falls. 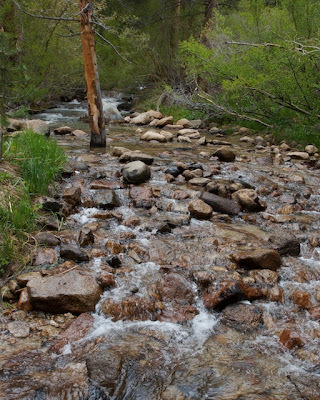 Gently flowing creek surrounded by a dense forest. Still with the creek running beside us, and the snowy crests of the mountains above us the sheer natural beauty of the world around us kept us moving on despite our situation. At the head of the valley we began a steep climb to access the basin above. We noticed now that there were patches of snow sitting below us on the adjacent mountain slopes. We climbed another steep leg of the trail over a muddy trail soaked from snow melt and a swolen river. The thinning air, and lack of food was draining us, but we knew the destination, the first lake, was close. The terrain leveled out and sky opened up as we approached the tree line. Clearly we were entering the lakes basin. 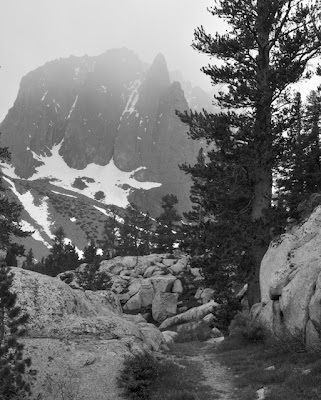 Heavy clouds and precipitation beginning to obscure Temple Crag. Then, mercifully, the trail crested a small ridge, and put us above the lake who's cerulean waters were remarkably choppy on account of the storm. We were jealous of a backpacker who had camped nearby who was already home here with plenty of fresh water and food. I encouraged Beylah to continue on to the next lake but was pursuased otherwise by her better judgement to turn around and head back. Two loud cracks of thunder confirmed that decision only ten steps back down the trail. The first lake of the basin. Our destination. The clouds gave way to a light mist, and Temple Crag which had loomed so gloriously above the lake had now become invisiable. It became clear the storm was done just "threatening" and was going to begin releasing an icy rain. Rain starting to fall as we surveyed the huge basin from near the first lake. Fortunately we keep moving downhill quickly, traversing through the aspen groves and making great time. The air was thickening as we made our way back, which suprred us on. The little bit of sugar in the life-savers gave us the small amount of strength we needed to get into the first dry stretch of canyon. Our focus became entierly on getting back to the car, stocked with Peanut Butter and Jelly sandwhiches, beer, and fresh fruit. As we entered the dry canyon the clouds finally caught up with us and soaked us with an icy rain which picked up getting heavier and heavier as we approached the car. Upended Foxtail Pine with the storm steaming in over the peaks. We passed several other hikers all of whom were racing back with us. Finally though we arrived back at the parking lot, very ready to call it a day, share a brew, and chow down. It was the final day of the trip though, and while the food was nice, I couldn't help but lament our return to civilization. Four hours of Beylah sleeping on my arm while driving through the desert and I was back at my apartment in Los Angeles. Two hungry people happy to be at the bottom of the trail (us). I love the flower behind your ear... It completely makes the photo.